American Indian tribes have taken greater control over prosecuting non-tribal members who commit some violent crimes in Indian Country five years after Congress passed a key law, a new report shows. [post_ads]But gaps remain after the Violence Against Women Act allowed tribes to bring criminal charges against non-Natives in domestic violence cases. For example, it doesn’t extend to violence against children or other family members, and tribal prosecutors are urging lawmakers to expand the law to cover everyone in a household. Tribal land was long known as a safe haven because U.S. authorities would only prosecute the most serious offenses and tribes lacked the ability to charge those who weren’t Native Americans. Since the law passed in 2013, tribal communities are empowered to report wrongdoing, governments are better collaborating and tribes are updating their laws, public safety advocates say. “It really has changed the culture in some of these tribes around domestic violence in a way that many people there report as overwhelming evidence,” said Elizabeth Reese, a project attorney for the National Congress of American Indians. The group released a report last month that shows the impact of the tribal provisions of the Violence Against Women Act: 143 arrests of non-Natives, leading to 74 convictions and five acquittals among 18 tribes in 11 states. About 90 percent of the victims are women. The majority of cases are being tried within four tribes: Pascua Yaqui near Tucson, Arizona; the Eastern Band Of Cherokee Indians in western North Carolina; the Tulalip Tribes north of Seattle; and Fort Peck Tribes in northeastern Montana. 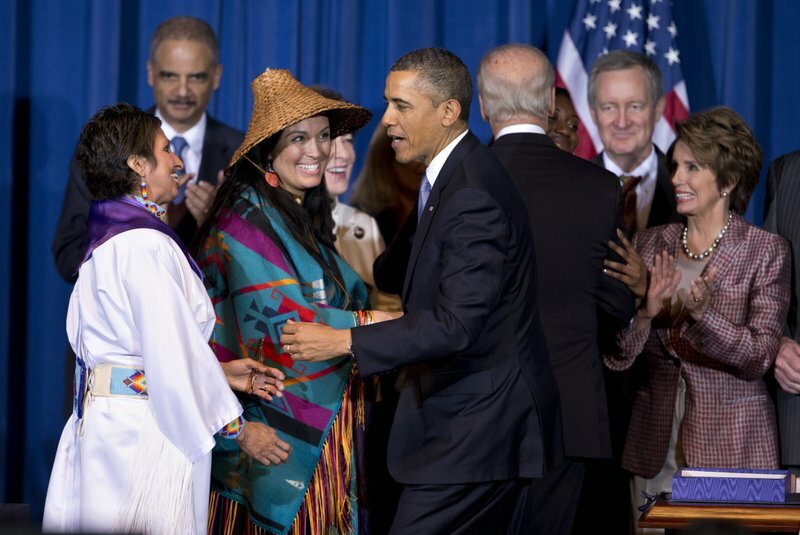 The United States has 573 federally recognized tribes. The Violence Against Women Act allows tribes to charge non-Natives for domestic violence against intimate partners or spouses and when protection orders are violated. The authority doesn’t extend to violence against children, family members or law enforcement and doesn’t include crimes by non-Natives who don’t know their victims or crimes by tribal members against non-Indians. Tribal prosecutors also cannot charge property crimes, sexual misconduct, false imprisonment, threats, trafficking or stalking — things they say limit their ability to make plea deals with offenders. Legislation pending in Congress seeks to address some of those holes and ensure tribes have the financial resources to implement the law — the most substantial hurdle for tribes, Reese said. The Eastern Band of Cherokee Indians, for example, had to pay an unexpected $60,000 in medical care for a defendant in tribal custody, the report said. At Pascua Yaqui, unexpected costs came in funding Spanish interpreters and transporting defendants to detention facilities. The National Congress of American Indians and others have called on Congress to give tribes full authority over all criminal offenses on land, regardless of the ethnicity of those involved. A 1978 U.S. Supreme Court decision stripped tribes of criminal authority over non-Natives. Which police agency responds depends on whether the victim, suspect or both are Native American — creating a complicated jurisdictional maze that sometimes results in no response, tribal officials say. Deputy U.S. Attorney General Rod Rosenstein has said about 85 percent of the Justice Department’s Indian Country investigations relate to violent crime. He said domestic and sexual violence against women and children is pervasive. “But it is not a reality that we are willing to accept,” he said in an address to the National Congress of Americans earlier this year. Giving tribes some criminal authority over non-Natives wasn’t easy to push through Congress, with Republicans worrying about the fairness of tribal courts and not having impartial juries for trials on reservations. Under the tribal provisions, defendants could seek recourse in federal court but none have, and juries have been made up of both Natives and non-Natives, according to the National Congress of American Indians report.